The Castle Ward main building is, indeed, the Castle. 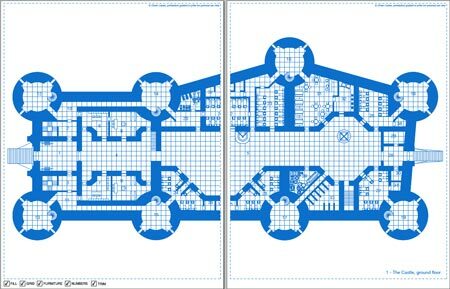 This blueprint product details the Castle only, because it could be considered a ward itself, being it a huge building with more than 130 rooms. Each map is a double-sheet map. The castle overlooks the entire Great City from the top of a green hill. Two gates, on opposite sides, give access to this mighty military structure. In times of needs, the castle can become a self-sufficient stronghold able to endure months of siege. 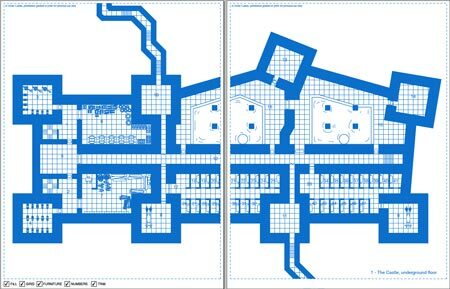 The number of the building refers to the map available in the Great City blueprint. The description of the castle levels follows. • Ground Floor: Part of the ground floor is a public domain space. The magistrates offices are found here, just next of the gateway. Beyond these public offices lie the castle’s army detachment, the castle garrison, with barracks, refectories, storage rooms and all the necessary to house a small part of the city army. • 1st Floor: The first floor is split in two distinct parts. Just above the public offices stand the great audience hall, where the city lord attends his duties to the citizens and a private area of parlors where the most delicate affairs are run. On the opposite side lie the barracks of the lord’s elite guards, just above the garrison’s quarters. • 2nd Floor: The second floor is dedicated to the lord’s apartments and comes split in half even if connected by large terraces. On the lord’s apartments side, you can find the lord’s bedroom, the office, the dining room and the guestroom. On the other side there are the officers quarters: these are utterly loyal soldiers that can assist the lord in times of needs. • 3rd Floor: This floor is a large terrace. In times of war huge catapults are built on this rooftop, from which it is possible to have a 360-degree view of the Great City and its environments. • Dungeon: The underground level is by far the most important of the castle, since it houses the food warehouses, the cisterns which provide water to the entire castle through two wells, the armories, housing catapults and warfare tools, and the storage room. On this level you can find even two jails, complete of torture chambers, and two well-hidden secret passages leading to the city below..